Well, I’m going to have at least one flower (maybe even two or three) on this stalk. A couple of the flower buds look like they might poop out but for sure, this one is going to open fully. I’ve never had three stalks on an amaryllis before. This one has certainly been special. Oh, and the snow is all gone. Melted away this past weekend with rain and mild temperatures. That doesn’t mean we won’t have another storm before the end of April, but if there should be snow, it won’t last long! I even noticed buds on the trees this morning while I was out and about. A couple of days ago I started a new quilt – the previous one really didn’t challenge my sewing skills (I was making it specifically for a friend who didn’t want anything too “fancy”). This time, I’ve started building something I think I’ll end up calling “Bamboo” – blocks cut freehand with contrasting inserts to look like stems with long narrow leaves. 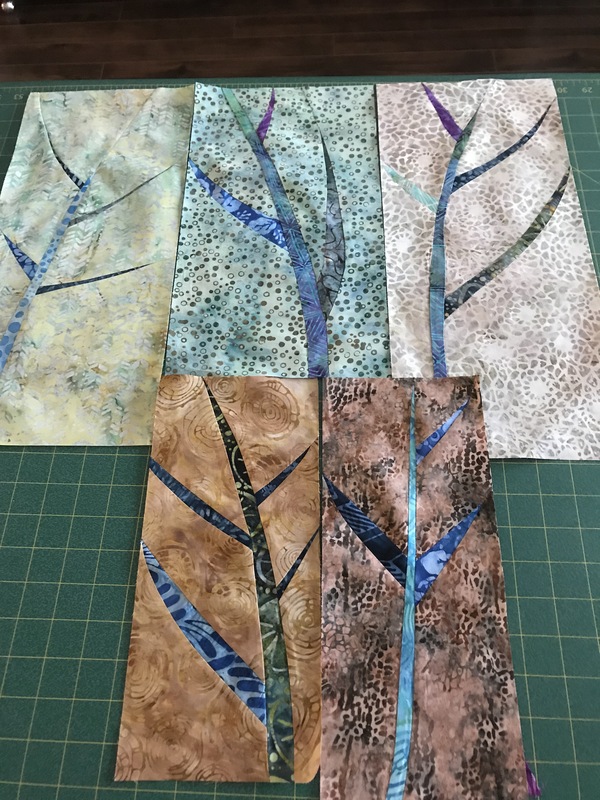 Quite difficult to execute, actually – these first five blocks started out with 9″ wide fabric but trimmed up somewhat less than 6″ in width because of the curvature that occurred with the leaf insertions. However, after eight blocks I think I’ve finally figured out how to execute the blocks – do the initial slashing cuts, then lay out the pieces and remove fabric from each cut so that when the inserts are stitched and pressed the block retains most of it’s shape and the size will be closer to the starting size. This block is cut, now to add the leaves and stem. 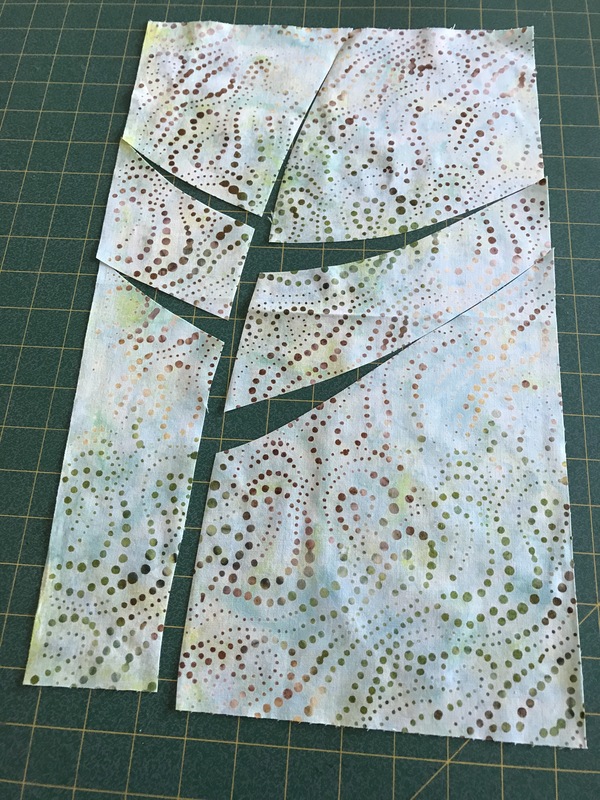 I’m not worrying about keeping block size consistent – they’ll come out whatever size they do; then I’ll fill in with other smaller piecing to make the whole work out. 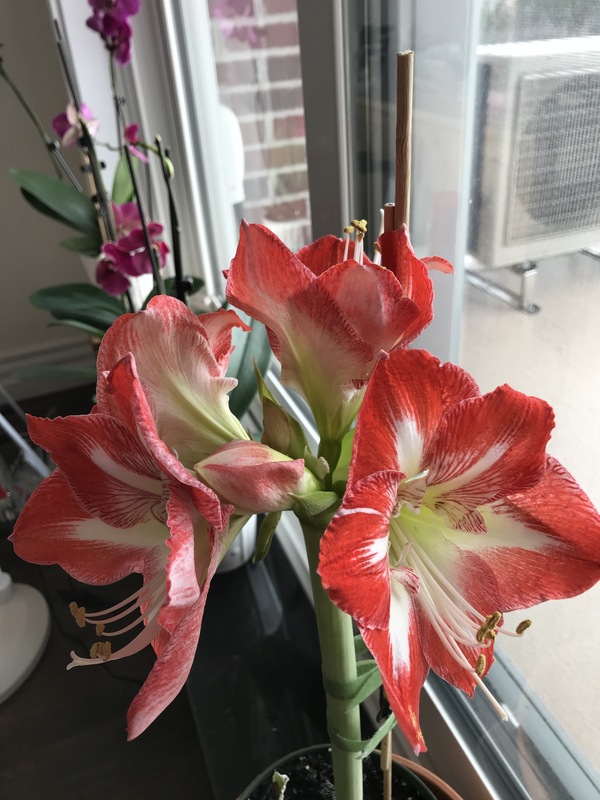 My amaryllis now has 6 flower blooms – four showing and two to come. That’s the most I’ve ever had on a stalk. The third stalk is still peeking out of the bulb – it’s not clear if it will actually grow or not. 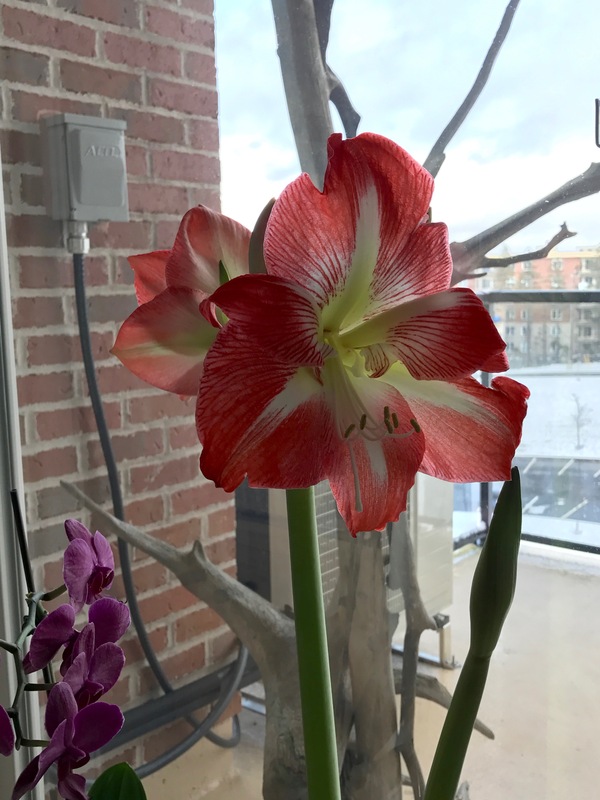 Amaryllis Stalk #2 – with 6 blooms! This set of blooms makes me smile each time I look at them. 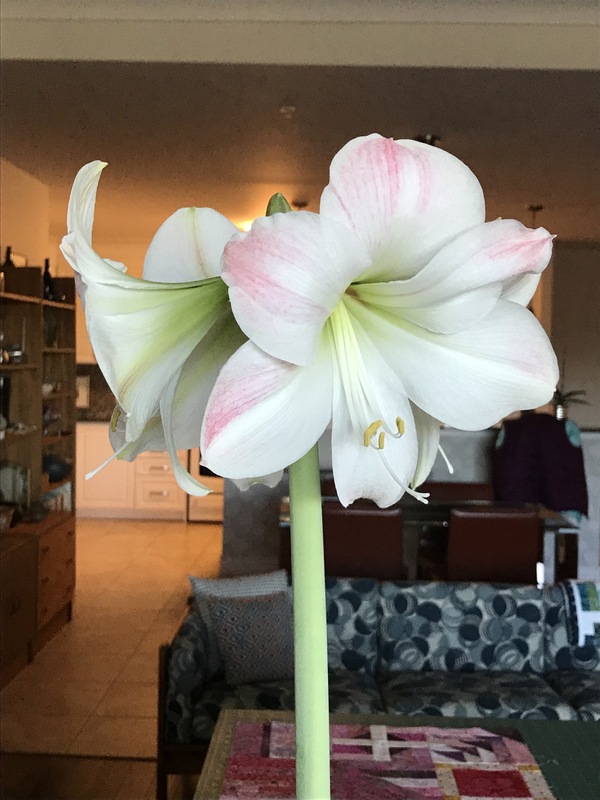 Here is the Amaryllis for this year (2017) – now fully in bloom (with a fifth flower still to come, it looks like). 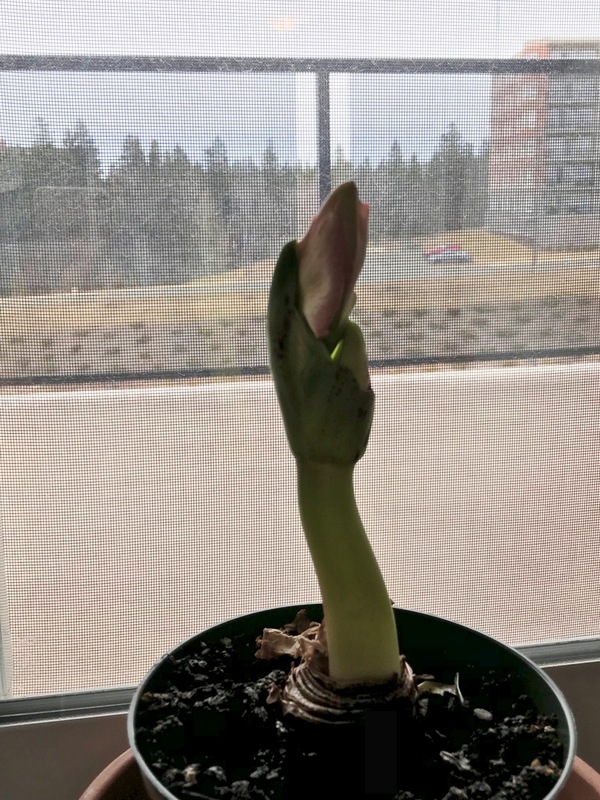 I picked up this bulb mid-November at the Superstore where I do most of my grocery shopping. I decided on a pale one for a change (I have mostly bought red ones). I love watching the flower stalk appear and grow so quickly and then the flowers begin opening – one by one. No second flower stalk from this bulb, it seems. Oh well, this one has lovely, happy blooms. I’ll enjoy them for the next week before they begin fading and then out it will go. I’ve never had any luck getting flowers for a second year. And then I opened my Christmas bag of stuff from a friend yesterday and guess what – another amaryllis – this one a red/white blend. I can see the stalk already peeping out just the tiniest bit – another thing to look forward to. 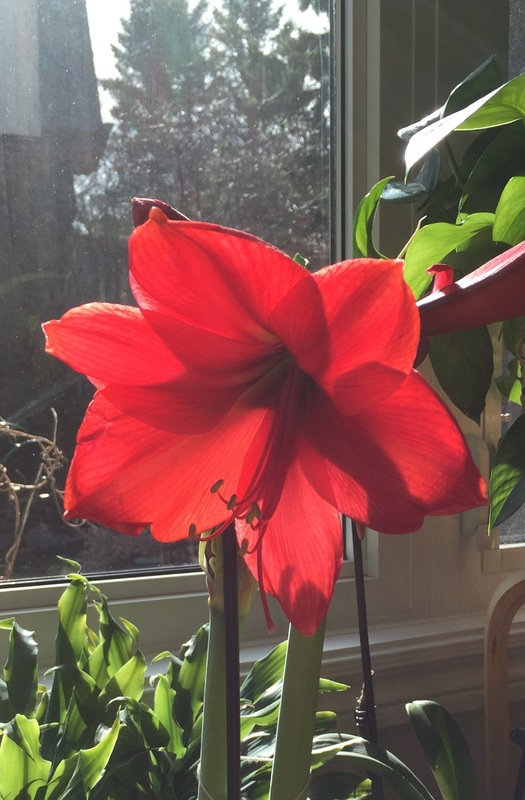 My amaryllis last year was a serious disappointment – one flower stalk which began fading before it was full opened. I look forward to a couple of weeks pleasure from this one (2016) – two sturdy stalks, each with four blooms. A bit of spring in the midst of winter! It snowed here yesterday – quite a bit of light blowing snow. The drifts on my back deck were, let’s say, interesting. I was just able to open my backdoor enough to get out and shovel off the top step. Then captured a picture of the drifting snow. 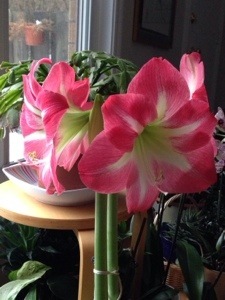 And today my amaryllis is in FULL bloom – 8 flowers at the same time – never been this lucky before. The red just glows. Finally my amaryllis is blooming. I potted the bulb as soon as I got it at Christmas, watered it sparingly – and finally it’s got flowers. It’s a double (the second stalk will be in flower in a few days). So I may actually have eight flowers at the same time – wouldn’t that be grand. My amyrillis is fully in bloom – standing straight and tall. Not a double bloom, but lovely nevertheless. The second stalk is tucked in, waiting for this set of four to finish, likely in a couple of days – then there will be four more blossoms.